The UCSF Staff Assembly is an association of more than 7,000 staff employees not represented by an exclusive bargaining agent. 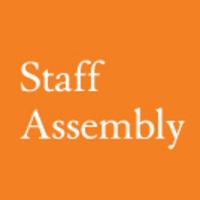 If you are a UCSF staff employee (campus or medical center) who is not union-represented or subject to any other provisions of the collective bargaining laws, you are considered to be a member of the UCSF Staff Assembly. This is our monthly UCSF Staff Assembly meeting. We meet on the third Tuesday of each month to discuss issues that impact staff and solicit feedback to share with campus leadership. All policy-covered, non-represented UCSF staff members are welcome and encouraged to attend! This meeting will also be livestreamed on Zoom (info to come).